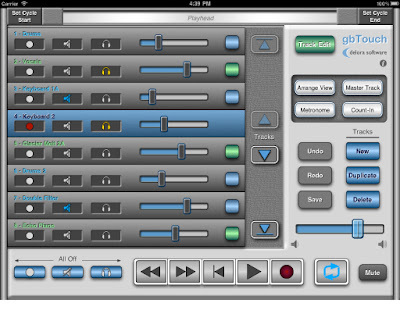 "Delora Software's gbTouch is an iPad app that seamless integrates many pro-level control surface features into GarageBand (Mac OSX version). It offers full transport controls (including a "jog strip" for easy play position movement), track mute/solo/rec, track names, track volume faders, and color-coding to indicate whether the track is a "real instrument" track, or a "software instrument" track. It uses Wi-Fi to connect to the Mac, giving you the freedom to control GarageBand from anywhere in your studio. gbTouch's multitouch UI automatically adjusts to your preferred orientation (landscape or portrait)." "The DRS-2 is the culmination of over 40 years experience designing Class A circuitry within the Audio Recording Industry. The DRS-2 was the first bespoke product to be launched by Phoenix Audio (UK) in the U.K. in November 1999, and has enjoyed an almost "cult" following ever since. The Class A output stage (TF1) was originally designed by David Rees, the designer of the famous Neve 2253 Limiter and 2254 Limiter/compressor (amongst many other designs), as a retrofit for Neve modules, and the TF1 has now been superseded by the DSOP2 output stage. The Class A, discrete, truly balanced, transformerless microphone input stage was designed to out-perform any transformer input for frequency response, yet has all the characteristics expected in a high quality Class A design, while the discrete, Class A, high input-impedance DI stage delivers a clearer, stronger and more defined and open sound that captures all the nuances and subtleties of your instrument." Class A Output specs. See the DSOP2 Specifications!! Phoenix Audio's unique Class A, transformerless, True balanced Mic input stage. "The AM-864/U is a peak-limiting audio frequency amplifier for use in either AM or FM broadcast system installations where it can automatically control the maximum level of amplification while retaining the audio quality of the program source. The AM-864/U could also be used in recording or in sound systems where automatic level regulation was going to be a requirement. The input Z is 600 ohms balanced and the output is also 600 ohms Z balanced, which is normal for most broadcast audio routing. Five tubes are used in the circuit that is powered by 115vac. The rear chassis adjustments control the point at which limiting is started and also how much limiting is allowed. The large control on the front panel controls the amplifier gain. The panel switch on the left selects if the meter is going to monitor the attenuation level or the amplifier output. The AM-864/U is a high quality device that had multiple uses and apparently the U.S. Army did use them in many different applications. Dates from the mid-1950s." The AM-864/U sounds amazing on kick, snare, bass, guitar and vocals. Recommend using an inline pad on the output as this unit has some serious output gain. hard bypass via the EMT power icon." showing actual use on a mix in the very near future.